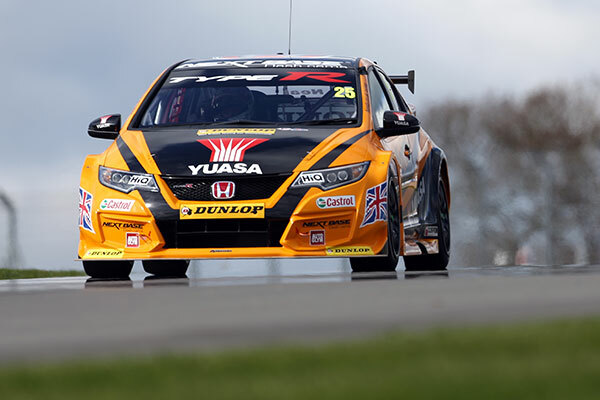 Halfords Yuasa Racing returns to a happy hunting ground next weekend (7/8 May) as the 2016 Dunlop MSA British Touring Car Championship speeds into Thruxton - with Matt Neal and Gordon Shedden eager to prove the prowess of the Honda Civic Type R around the UK's fastest circuit. Neal and Shedden consolidated their positions at the top of the Drivers' standings with a commanding one-two finish for Halfords Yuasa Racing in the most recent BTCC outing at Donington Park - a result that mirrored the one they achieved at Thruxton this time last year, when Shedden led Neal to the chequered flag in close formation. Following the squad's impressive start to the season, Halfords Yuasa Racing heads the Teams' title chase and Honda the Manufacturers' battle, and both drivers are optimistic that the potent Civic Type R will be in its element around Thruxton's flat-out sweepers. Matt Neal: "The great appeal of Thruxton is that it's still old-school - unspoiled by health and safety warriors. It's the fastest track on the calendar - reaching top speeds of almost 160mph and an average of 115mph - so it's a proper white-knuckle ride and youâ€™re really hanging on at times! It's a bit of a home circuit for the team because it's so close to Swindon, where Honda manufactures the Civic worldwide. We go there with a lot of weight again, so it's not going to be an easy task with how competitive the championship is right now and the strength-in-depth of the drivers and cars, but Thruxton has traditionally been a happy hunting ground for us so we'll certainly be gunning for more wins next weekend!" Gordon Shedden: "Thruxton is one of those circuits where you need to take a deep breath, tighten the belts a bit more and just hang on! It's somewhere that always generates great racing and entertainment and historically, the Civic has gone very well there, so we're hoping for more of the same. The Type R is really nicely-balanced with an excellent chassis, which is essential at Thruxton. The key factor is the speed and flow you can carry round the back of the lap, which is where our car is particularly strong and we need to take advantage of that. With the success ballast on-board, we'll have to work hard again in qualifying but we'll give it our best shot and ultimately, our objective is simple - to score more points than anybody else."